This BSc combines a broad-based training in mathematics with highly practical modules from the UCL School of Management, which will be of direct use to those seeking a career in management. No previous knowledge of management studies is required. A score of 19 points in three higher level subjects including 7 in Mathematics, with no score below 5. Gain transferable skills such as numeracy, problem-solving and logical thinking, which can lead to a large variety of interesting, diverse and well-paid careers. All of the modules given by the UCL School of Management are validated by external experts from the private, public and charitable sectors. Many of our graduates choose to build their management knowledge and experience by taking a further management qualification, such as the MBA (Master of Business Administration). Internationally renowned UCL Mathematics is home to world-leading researchers in a wide range of fields, especially geometry, spectral theory, number theory, fluid dynamics and mathematical modelling. In the first two years of the programme you will receive a thorough grounding in pure mathematics and mathematical methods following the same modules as the single-subject Mathematics students, taking 3.0 credits of pure mathematics/mathematical methods each year. In place of the Applied Mathematics modules you will take two half-credit modules in management studies each year. Having laid the basic foundations there is a wide range of options in both mathematics and management studies in the third year. One of the modules may be replaced by a half-credit outside option, subject to departmental approval. 1.0 credit of third-year mathematics options, suitable Management options or approved outside options. 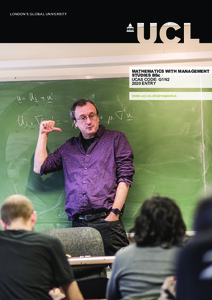 Detailed course descriptions are available on the department website: Mathematics with Management Studies BSc.